Wash, drain, and hull fresh strawberries. Allow strawberries to juice. Add water if necessary to make 1 1/2 cupfuls. Cover cooled pie shell with strawberries, keeping out a few for garnish. Bring juices to a boil over low heat; add cornstarch, flour, and sugar. Continue boiling, stirring constantly. Boil for 1 minute. Chill for several hours. 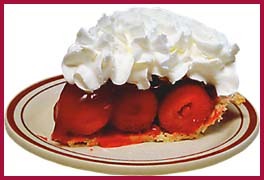 Cover strawberries on pie shell with cooled juices. Chill again. Try to make the pie in the morning and serve it that evening. Cover with whipped cream and garnish with strawberries.